Art Elements Component of the Month – January Reveal. Well January is over already (it seems 2017 is going to fly by) and it’s time for the first Art Elements design challenge of the year. Hosting this month is Lindsay Starr who provided the AE team and its guests with these wonderful and unique formed leather cabochons. My first instinct was to do something with an underwater feel as the cabochon I received reminded me of wet rock in pools and I had a star fish cabochon that I thought it would combine well with. However, when I came to start the proportions were all wrong and I couldn’t make them work together. Back to the drawing board and I really didn’t have much going on in my head at that point so I decided to just start beading around the cabochon and see what happened. 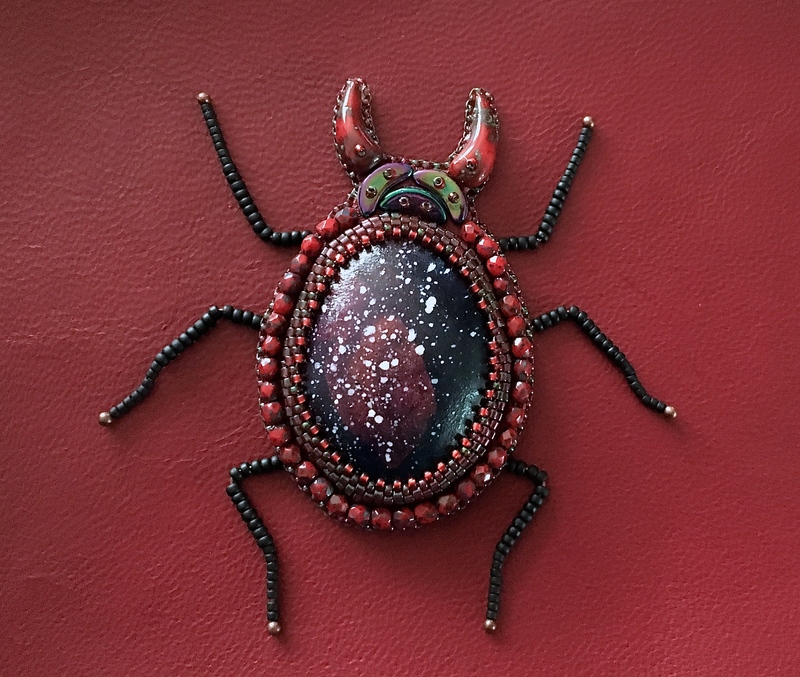 I glued it to some red leather and while It was drying it occurred to me that it looked something like the carapace of a beetle…hmmm maybe the spark of an idea. Once the peyote bezel was done I decided to go for it and managed to find some beads that gave the effect of a stag beetles horns and some metallic beads that evoke that armour plated look they have and this is what resulted. So far so good. This piece is quite large so at this point I decided it was going to be a decorative piece rather than jewellery. I played around with some ideas to give him legs and settled on beaded head pins. And that unfortunately is as far as I got. I didn’t have time to create a finished product but I think it’s going to be the cover of a handmade journal maybe using more of the red leather… we shall see. Many thanks to Lindsay for setting us this great challenge and I hope you will pop along to the blogs below and check out what everyone has made for this months challenge. OMG – this is brilliant! Well played, Lesley. You never fail to amaze me – do you ever run out of ideas? Amazing, I love the idea and the colors! This is a brilliant idea for the leather cab!! I just love this beetle. You did a fabulous job and I’m sure the art journal you create for it will be fabulous. So imaginative, love your bug! Lesley-Well done! I love your handsome beetle. Oh, I love him! The way how you made these little “horns”, the make him adorable (yes, I think a lot of beetles are just stunning beautiful!). Strangely enough I could imagine him being a head piece! It is awesome! I would totally wear it as a brooch or hair ornament! 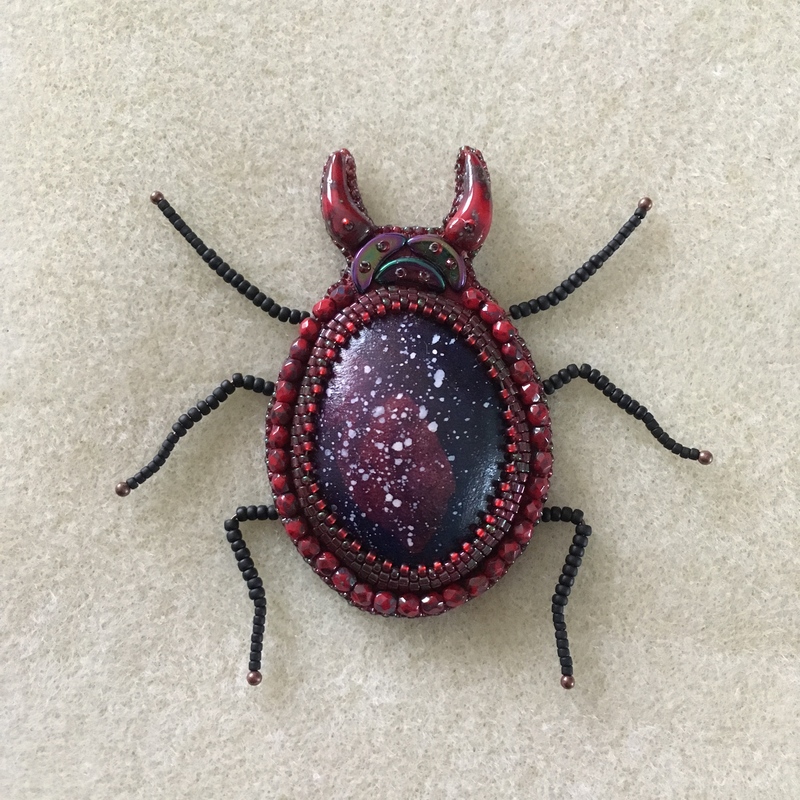 Thank you for inspiring me to make more cabs…with beetle markings! This is absolutely brilliant! Great job. Beetles usually don’t make me want to pick them up and take a closer look, but this one does! OMG the beetle is just gorgeous, Lesley! I’m so very inspired. What a wonderful piece, I tend to see one or two stag beetles each year and find them both intriguing (because of how gently/slowly move) and terrifying (because of the sheer size of some of them). I love that red leather. He is rather cute for a bug, LOL Your use of unusual bead shapes like the chilis and crescents always inspires me! Wow – so imaginative. I’m fascinated! Brilliant! Such a creative use for the cab. He is especially stunning on the red leather. Totally in lo e with it. Brilliant! Your designs are always beautiful & so unique.